What are the defining characteristics of the personalized learning schools, including the experiences of students, roles of teachers, approaches to student progression, and use of technologies? What are teachers‘ and students‘ perceptions of the schools? How do characteristics and perceptions differ from a national sample of schools? How do students attending the personalized learning schools perform on measures of academic achievement, relative to similar students in more traditional schools? What aspects of personalized learning are present in schools with the strongest academic outcomes? 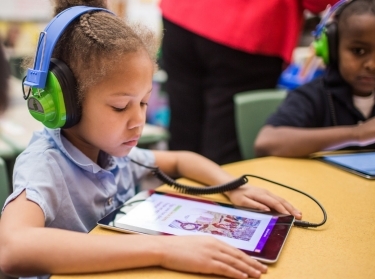 The adoption of personalized learning approaches has increased significantly in recent years. This report examines achievement in 62 public charter and district schools that are pursuing a variety of personalized learning practices, and examines implementation details in 32 of those schools. Researchers obtained achievement data for personalized learning students and a matched comparison group of students attending other schools serving similar populations. They also collected and analyzed data from site visits, interviews, and surveys to create a broad picture of the schools' efforts to implement personalized learning and the perceptions of teachers and students. The achievement findings indicate that compared to peers, students in schools using personalized learning practices are making greater progress over the course of two school years, and that those students who started out behind are catching up to perform at or above national averages. The study finds that teachers at most schools were using data to understand student progress and make instructional decisions, all schools offered time for individual academic support, and the use of technology for personalization was widespread. However, some strategies, such as competency-based progression, were less common and more challenging to implement. Student achievement growth in mathematics and reading over two years exceeded that of a comparison group, overall and in a majority of schools. A large proportion of students with lower starting achievement experienced greater growth rates than peers, particularly in mathematics. Growth continued to accumulate in schools with three years of implementation. All schools used data from a variety of sources to understand student progress and make instructional decisions. Fewer reported implementing personalized goals and providing data to students and discussing it with them. Students' choices about their learning varied by course, teacher, and age. Fewer schools were implementing competency-based progression than other personalized learning strategies. Educators reported that the learning space was supportive of personalized learning, learning time was structured to be flexible and responsive to student needs, and that they were thinking flexibly about how staff were used. Schools were also developing non-academic skills in preparation for life after high school. 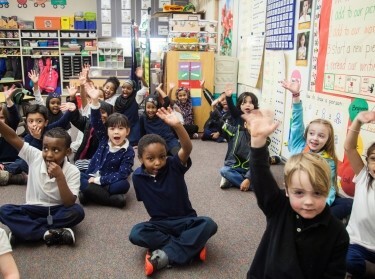 Schools with the greatest achievement gains reported strong implementation of: student grouping strategies driven by data and responsive to student needs; provision of data to students and including them in discussions of the data; and learning spaces that support personalized learning strategies. Relative to a national sample, personalized learning teachers were more likely to use technology for personalization, to report use of instructional practices that support competency-based learning, and to agree that their schools' data system was useful; and students were more likely to report that their mathematics and ELA instruction incorporated aspects of complex, student-centered instruction. John F. Pane @JohnFPane, Elizabeth D. Steiner, et al. Elizabeth D. Steiner, Laura S. Hamilton @HamiltonLauraS, et al. The research described in this report was conducted by RAND Education and supported by the Bill & Melinda Gates Foundation. For this document, different permissions for re-use apply. Please refer to the Bill & Melinda Gates Foundation section on our permissions page. 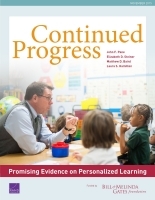 Pane, John F., Elizabeth D. Steiner, Matthew D. Baird, and Laura S. Hamilton, Continued Progress: Promising Evidence on Personalized Learning. Santa Monica, CA: RAND Corporation, 2015. https://www.rand.org/pubs/research_reports/RR1365.html.